Production Co.: Hearst Metrotone News (Metro-Goldwyn-Mayer, distributor). Release Date: December 19, 1934. Narrator: Edwin C. Hill. Transfer Note: Copied from a 35mm print preserved by UCLA Film & Television Archive. Running Time: 10 minutes. For most of the twentieth century, the moviegoing experience was inconceivable without a newsreel. Released to theaters once or twice a week and running about ten minutes, newsreels at their best were more than loose anthologies of political and sporting events, scandals and ceremonies. As evident from the issue seen here, a roundup of the year 1934, newsreels had arguments to make. Hearst Metrotone News began with the coming of sound film in 1929 and survived into 1967, the final year of newsreel production. It was controlled by newspaper mogul William Randolph Hearst, who had been producing silent newsreels since 1914. Each December, in place of a regular issue, Hearst Metrotone News usually put together a year-end summary, with editing and voice-over even more fast-paced. The News Parade of 1934 makes an emotional argument through its organization alone, which moves from chaos to confident solutions. After the frightening scenes of European politics and of droughts, fires, and earthquakes around the world, we move to America’s rule of law. Bruno Hauptmann is arrested for the Lindbergh kidnapping, “public enemies” John Dillinger and “Baby Face” Nelson meet death by “the government’s gun,” and the new Alcatraz prison makes escape for others impossible. Triumphs of engineering, feats of aviation, advances in production, overseen by President Roosevelt in close-up, bring the ten minutes to an uplifting climax for American audiences. 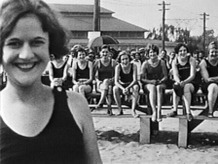 The missing music between sequences arises from the way the Hearst producers recut the newsreels after initial re­lease. For each issue, they generally kept one copy of the negative and the print and cut both into component stories for easier reuse. The Hearst Corporation donated this material to UCLA Film & Television Archive, which has worked backward from synopsis sheets to reassemble complete newsreels from the small film rolls. Often the original print—which alone holds the release soundtrack—was more severely truncated, as is the case with The News Parade of 1934. The sound goes silent where only the negative survives. UCLA’s Hearst Metrotone News Collection consists of some 27 million feet of film. A rare complete Hearst newsreel from the silent era, International Newsreel (volume 8, issue 97, 1926), also preserved by UCLA, is included in More Treasures from American Film Archives.